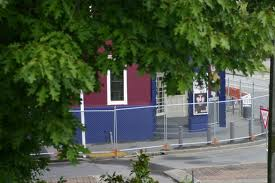 The Fences have gone from the Junction: an Earthquake Survivor in #Rangiora. The facade of the former Junction Hotel (later Robbies) has been saved and the construction fences have now gone. Great to have the old lady back! A pity the wind didn’t blow yesterday but the Belgian flag flew to commemorate Belgium’s national day. Waimakariri has a twinning relationship with the municipality of Zonnebeke on the Passchendaele battlefield. The following link is from the blog of Freddy Declerck, a very good friend of New Zealand, and it records some of the events about the time of this year’s ANZAC Day. The municipality of Zonnebeke includes the Polygon Wood and Buttes New British cemeteries which commemorate New Zealanders and Australians who died in this area near Ypres (Ieper) during World War I.
Freddy Declerck is a former Belgian naval officer and the recently-retired director of the Passchendaele Memorial Museum in Zonnebeke, which features a section on New Zealand. He is, as you would expect, extremely knowledgeable about New Zealand’s involvement and is a wonderful guide. 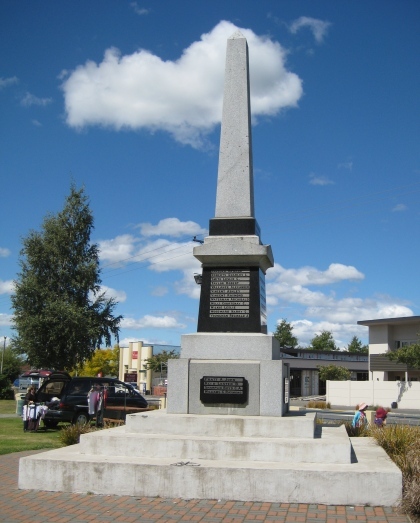 Waimakariri has a twinning relationship with the Municipality of Zonnebeke, the area of which includes the site of the Battle of Passchendaele and other battles at about that time. A new commercial building is arising on the corner of Williams and Charles Streets where the Post Office once was. A corner clock tower is incorporated in the design, a nod to past history. The Post Office originally had a clock tower but this was removed in the 1930s as a safety measure following the Napier earthquake. Much of the façade has now been shotcreted on the back. The concrete you can see has a lot of steel in it. Once some temporary bracing has been put in place, the rest of the building can be demolished. The bracing will be removed when a new building is constructed by new owners. 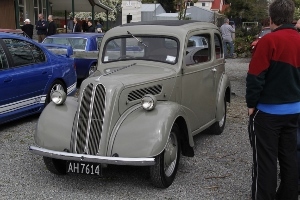 If you were in Kaiapoi, Tuahiwi, Loburn, White Rock or Rangiora yesterday, and saw a huge variety of vehicles of varying going past and wondered what was going on, a closer look would have told you they were Fords. Fords come from a variety of places, of course: USA, Britain, Australia, even Japan. Yours truely was therein our 1968 Corsair, but the variet was huge, from a Model ‘T’ and a number of Model ‘A’s, to Cortinas, Mustangs and Thunderbirds. The car pictured is a 1955 Ford Popular. The annual Henry Ford Rally always starts in New Brighton and often finishes north of the Waimakariri. For many years it has been run by Trevor and Lorraine Stanley, recently of Christchurch but now of Amberley. At right is a 1955 Ford Popular at the finishing point, Rossburn, near Rangiora. Thanks to Lois McGirr of Amberley, a series of women’s suffrage commemorations were held in Amberley, Rangiora, Kaiapoi and Woodend on 19 September, the 120th anniversary of the passage of the Act that gave New Zealand women the vote. Speakers paid tribute to the work of local North Canterbury women who fought for the vote and the role played by the Women’s Christian Temperance movement. 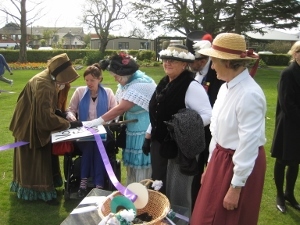 They also rolled out a long purple ribbon that many locals had signed, the ribbon being the same length as the petition that Sir John Hall took into Parliament in 1893 in support of women’s suffrage. The photo shows the ribbon being signed by Maxine Palmer of Rangiora. A local historical footnote: New Zealand’s first woman MP, Elizabeth McCombs, was born in Kaiapoi. The Ashley Masonic Lodge has been demolished this week. It was damaged in the September 2010 earthquake and hasn’t been used since then. 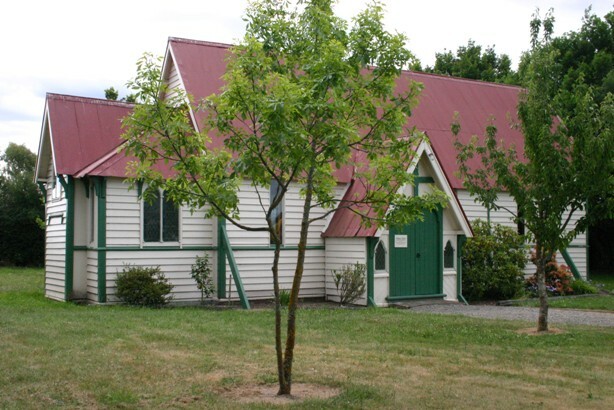 It was a Category II building listed with the NZ Historic Places Trust and was on the Waimakariri District Council’s heritage list in the District Plan. 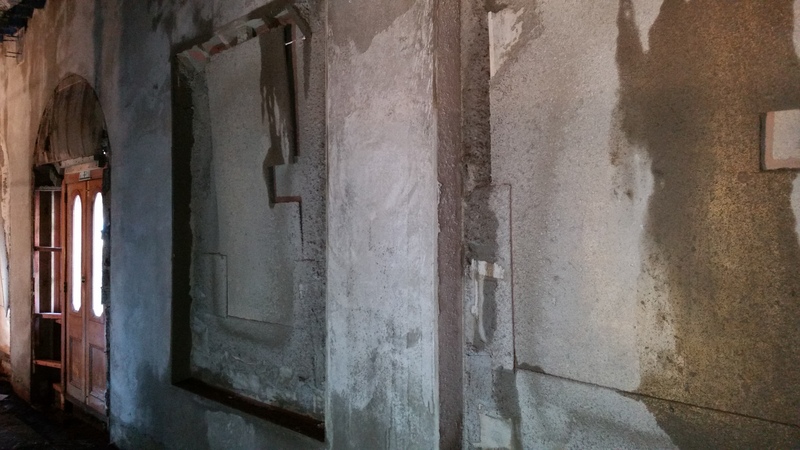 As with all heritage buildings, a lot of work went into seeing if it was practicable to save it, but the cost of doing so was simply beyond the means of the Lodge. 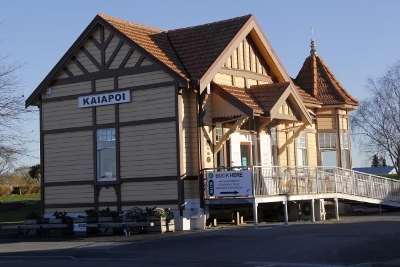 The Kaiapoi Railway Station is now on its third site in its lifetime. Originally on the railway line (of course!) 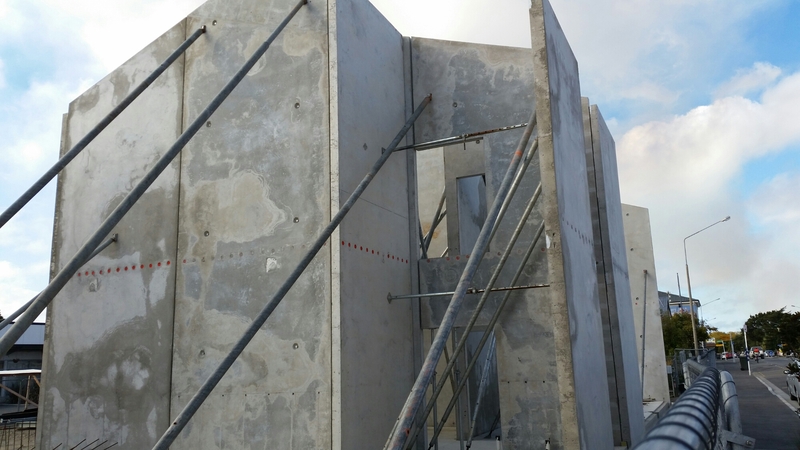 near where the Countdown now is, it was moved to its second site on top of the stopbank near the Tuhoe wharf. The September 2010 earthquake put it on a spectacular lean, so it is now temporarily not far away on Charles Street. With the District’s i-Site now back in residence, it is performing its previous function. Last month the Prime Minister unveiled the District’s latest Landmarks plaque on it. Although work was actually authorised and budgeted for a year ago, the Waimakariri Council has just considered submissions to this year’s Annual Plan and has further approved the work. It is hoped to call for tenders in July. Expressions of interest from construction companies have already been received and there has been an impressive response. Nearly half the cost of $11.5m will go towards strengthening the existing building, including anchoring the old part to the new extension. 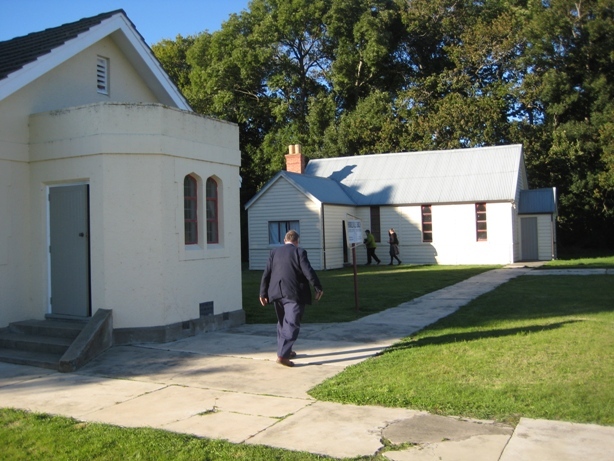 The additions have received the approval of a heritage architect and the New Zealand Historic Places Trust. This was necessary because it is a Category 2 Historic Building. The auditorium will receive some upgrading, such as a new orchestra pit and audience seating, but will essentially remain as it is. What the extension will give the community is a flexible 150-seat smaller theatre alongside, greatly improved backstage facilities for performers and crews (the current facilities are awful), much better foyer space both upstairs and downstairs, better toilets for audiences and four smallish rooms that can be used for music tuition, meetings, etc. The movie theatre will be moved downstairs. 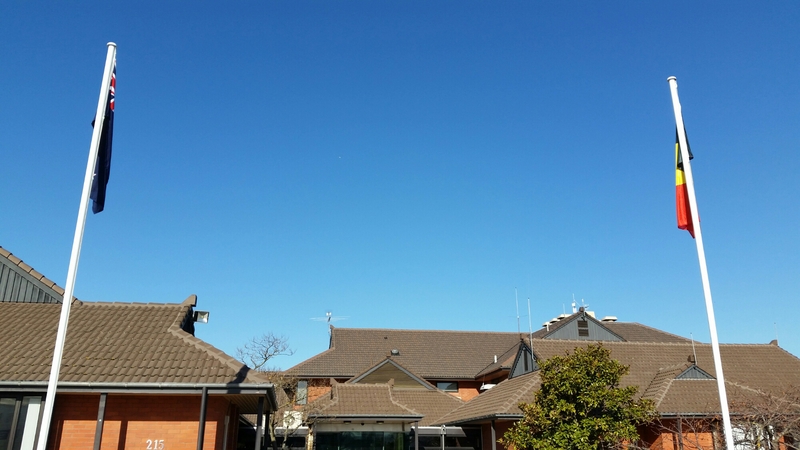 While the extensions will take up some of the car-park space, we need to remember that the Council car-park is only 2-3 minues walk away – and it is largely empty in the evenings when most large Town Hall events occur. There is now a footpath beside the driveway connecting the Council car-park with King Street. 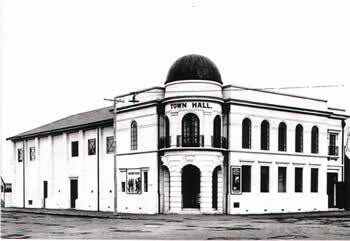 Thousands of people used the Town Hall every year before it was closed, either as performers or audiences. This upgrade will meet their needs a lot better. The enhancemen of the town Hall will also help in the revitalisation of the Rangiora Town Centre. The Rangiora Museum is doing a project on the shops on High Street. They would like to see any photos or information anyone may have of shops that are or were on High Street. The contacts are Pam Mackintosh (313 9343), Ann Jelfs (313 7592) or Leith Newell (313 8505). 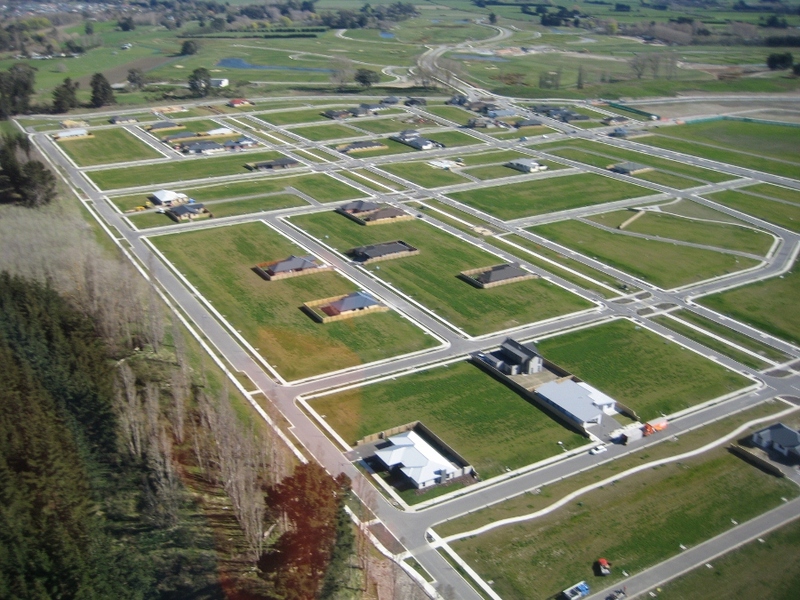 The area cleared by CERA in Courtenay Drive, Kaiapoi – before the earthquakes a residential area. Keeping a photographic record for the future is well worth doing. The central parts of our towns are probably getting well photographed as they change, but I wonder about the residential areas in Kaiapoi, The Pines and Kairaki. The changes are occurring progressively – the scene on the left is as it is now, but was the process of getting to this state photographed? To give some idea of the scale of the change, Kaiapoi has lost or will lose somewhere between 30 and 40 commercial or community spaces in the town centre since the September quake. Hunnibell’s (now Capone’s) is a Waimakariri “Landmark”. 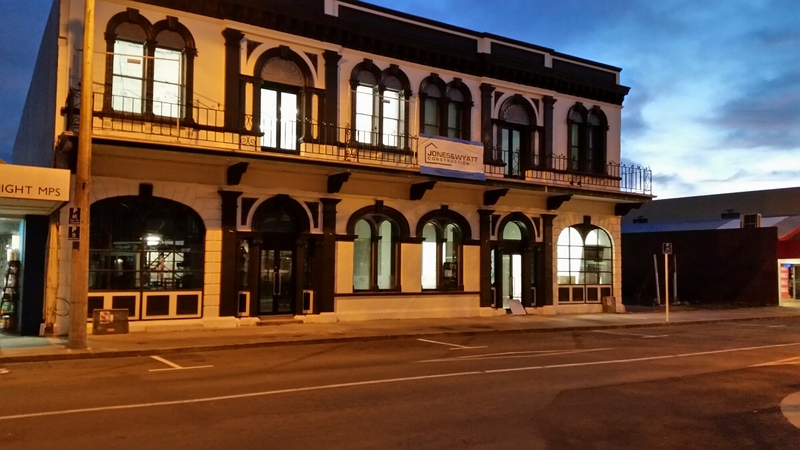 Capone’s Restaurant, which started life as Hunnibell’s Boot Shop in the early 1870s, is a well-known building in Rangiora – in fact it is the oldest commercial building in the High Street. At various times (after a long time as a boot shop), it has been an accountant’s office, a beauty salon and a bike shop – and the rooms upstairs, where the Hunnibells once lived, were let as a flat for a time. Apart from the brick chimney which goes up the middle, the building appears to have survived the earthquakes well. 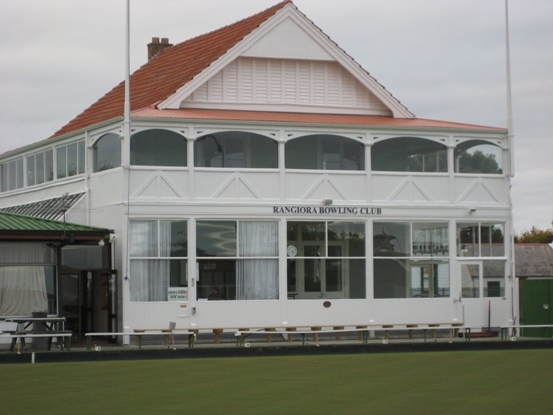 The Landmarks programme recognises heritage buildings in the town centres of Rangiora and Kaiapoi. Buildings that are being considered have to be well maintained and research is done into their history before they are approved. As much information as possible is put on to the plaque, but further information is also put on the Council website at http://landmarks.waimakariri.govt.nz/home.aspx . The Ashley Bridge Looks Interesting from Underneath! This photo of the Cones Road Bridge over the Ashley near Rangiora, with a fair bit of water going under it a couple of weeks ago (no, it wasn’t closed!) shows the fix-it job done when it was found that the river was scouring out under the piles. The little bit of weed you can see beside the bridge is caught on one of the piles left from the pre-1910 “cart” bridge. Thousands of people have walked past it without reading what it is all about, but the little monument has a dual purpose. 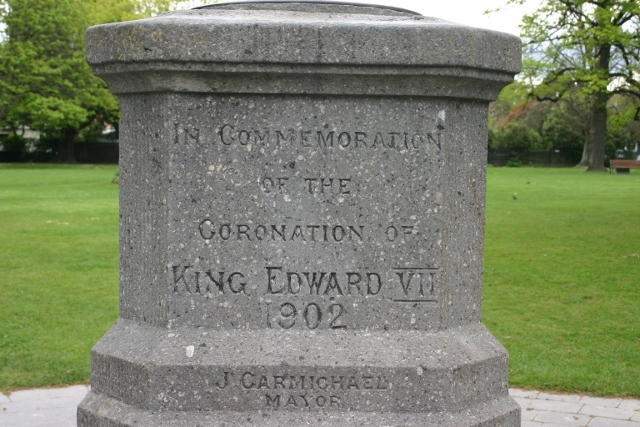 One one side it commorates the coronation of King Edward VII in 1902 (he had succeeded his mother Queen Victoria the previous year). 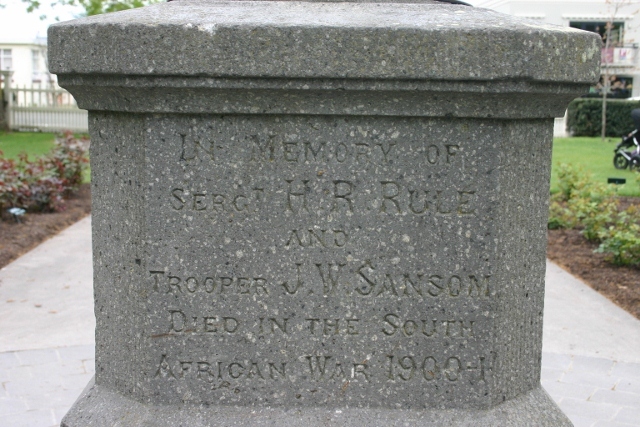 The other side, however, is a memorial to two Rangiora soldiers who died in the South African War of 1899-1902, Sergeant H R Rule and Trooper J W Sansom. And there is actually a third purpose: a sundial on the top! Pegasus in September 2009. It is easy to forget how much it has grown. 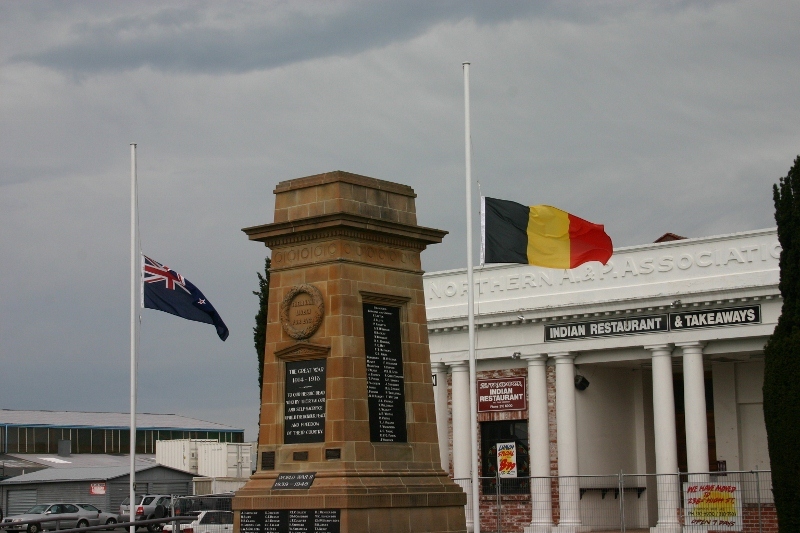 New Zealand and Belgian flags fly at half-mast in Rangiora in memory of those who died at the Battle of Passchendaele in 1917. Troops from 2nd Brigade and 3rd (Rifle) Brigade advanced at 5.25 a.m. in drizzle that soon turned to driving rain. As they struggled towards the ridge in front of them, they found their way blocked by the uncut barbed wire. Exposed to raking German machine-gun fire from both the front and flank, the New Zealanders were pinned down in shell craters in front of the wire. A few determined individuals tried to get through the barrier, but they were quickly killed. Orders came for another push at 3 p.m., but this was mercifully postponed and then cancelled. The troops eventually fell back to positions close to their start line. For badly wounded soldiers lying in the mud, the aftermath of the battle was a private hell; many died before they could be rescued. The toll was horrendous. There were more than 2700 New Zealand casualties, of which 45 officers and 800 men were either dead or lying mortally wounded between the lines. In terms of lives lost in a single day, this remains the blackest day in New Zealand’s post-1840 existence. Rude awakening, thinking of Haiti. Thinking the house was coming down, but then it didn’t – in fact, seemed OK.
Newstalk ZB off the air – so back to the National Programme. Surprised it wasn’t the alpine fault. 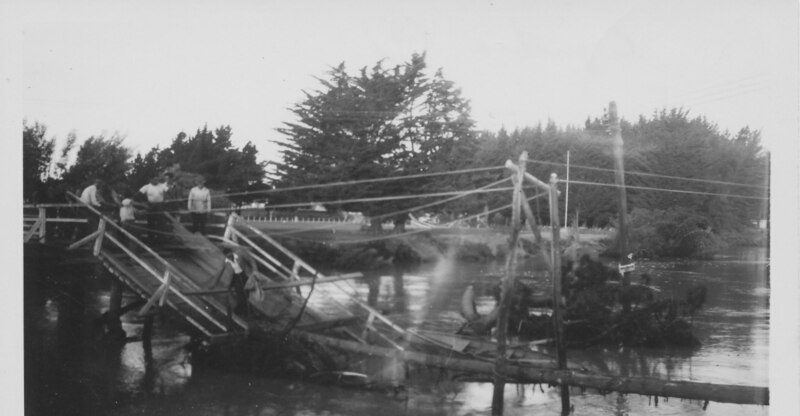 Radio report that Harcourts Kaiapoi down – oh! oh! Walking into the Emergency Operations Centre (EOC) with a guy offering a helicopter. Still dark. Intelligence gathering already underway. Clear biggest problems were around Kaiapoi. Main bridges closed, just in case they were unsafe. EOC starting to hum. Staff drifting in. Crews out checking water, sewer, roads. Got a ride from Southbrook in first helicopter flight with Council engineers Gerard Cleary and Gary Boot – pumping stations and pipelines their priority. Hilton St by Dudley Drain – culvert has popped up – impassable to vehicles. Charles St sewerage pumping station doesn’t look good. Liquefaction all through eastern Kaiapoi. More of it in Kairaki and Pines Beach. Power pole just about down. Ocean outfall pipeline seems OK.
A bit of liquefaction at Woodend Beach and Waikuku Beach – not too bad. 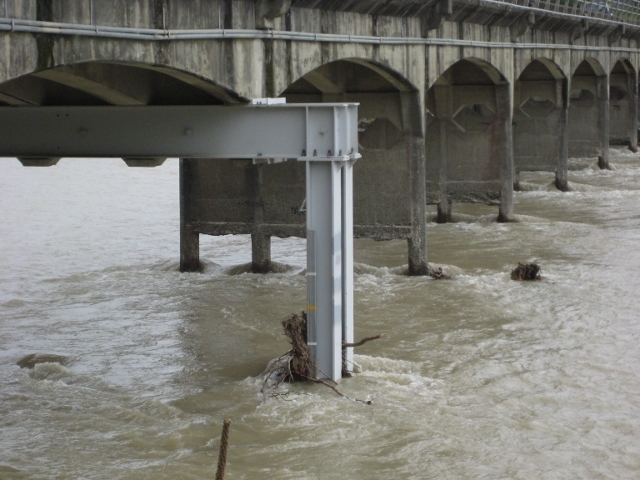 Pegasus and Woodend look OK.
Ashley Bridge north of Rangiora has stayed up – surprise! Rangiora looks good from the air. Back to landing point in Southbrook. In Kaiapoi now. Bridge closed by Police. Museum really badly knocked around. Corcoran French and old BNZ (John Rhind) buildings on a lean. Former Post Office looks OK, but wouldn’t trust it. Blackwells damaged – excavator is making it safer by knocking bits off it. National and regional news media concentrating on Christchurch. And through it all, a beautiful spring day. Many people left their homes, but by nightfall, all had found somewhere to go. No-one had to be put up at the welfare centre. The EOC stayed on duty all through the night, but there was little to do until daybreak. The blog has been a bit quiet for a few days because I have been in Australia doing a bit of grandad duty (our only grandchild, Imogen, is now 11 months old). We got back yesterday, in time for ANZAC Day. I was involved in three services today: in Kaiapoi, Rangiora and Tuahiwi. Each was different but all were impressive in their own ways. There were very big crowds in the two main towns and a much smaller gathering, as one would expect, at Tuahiwi. There were other services in Oxford, Cust-West Eyreton and Fernside and at Rangiora High School. As has become the practice, an Ohoka service took place yesterday. 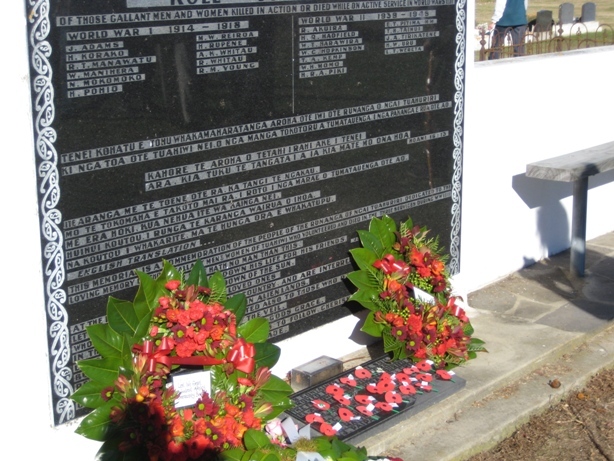 The memorial at Tuahiwi exemplifies what goes on all over the country and in Australia. One of these buildings is a church! Actually, as most locals know, it is the one on the left that is St Mary’s Anglican Church. It is still used by a small group of parishioners, even although the building is no longer owned by the Anglican Church. The new one on the right is part of the new Rangiora Mazda complex, owned by Hanish Hide. He has decided to keep the church on his property and work his new workshop and administration area around it. Good on him! Rangiora Mazda has to move from across the road because that site is now owned by Foodstuffs and will be the site of a Pak n Save supermarket. I can think of few buildings in Rangiora that are more worthy of the the term “landmark” than this one. It occupies a prominent place on the corner of Blackett and Good Streets, which would be one of the town’s busier intersections. 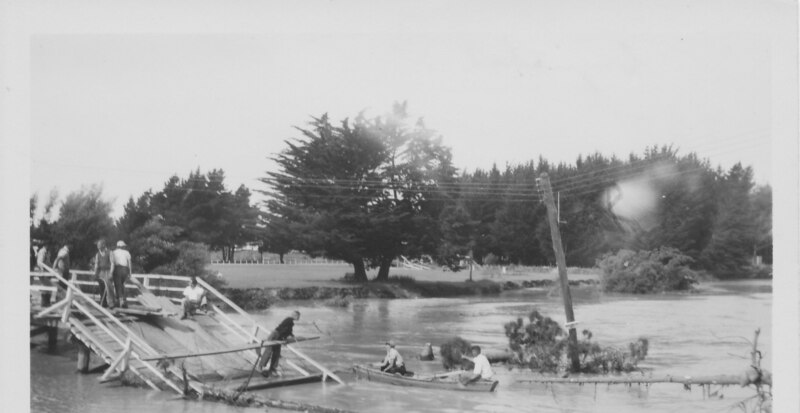 The Landmarks project has been ongoing over a number of years, starting as an inititaive of Our Town Rangiora, the Rangiora and Districts Early Records Society and the Council. The aim is to recognise the work of owners to preserve their heritage buildings in the centre of the town and to inform people of the history of those buildings. The programme has been more recently extended to Kaiapoi. Other recent plaques have gone on the Kaiapoi Band Rotunda and the the former Parrott’s grocery store in Rangiora (now Rangiora Eyecare). 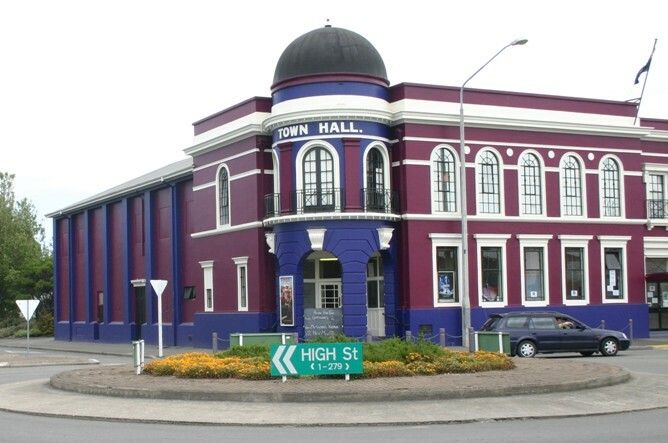 We have lost a number of heritage buildings in the District because of the earthquakes and others have been closed to the public because they have been assessed as dangerous. It is great, therefore, to have a good-news story! 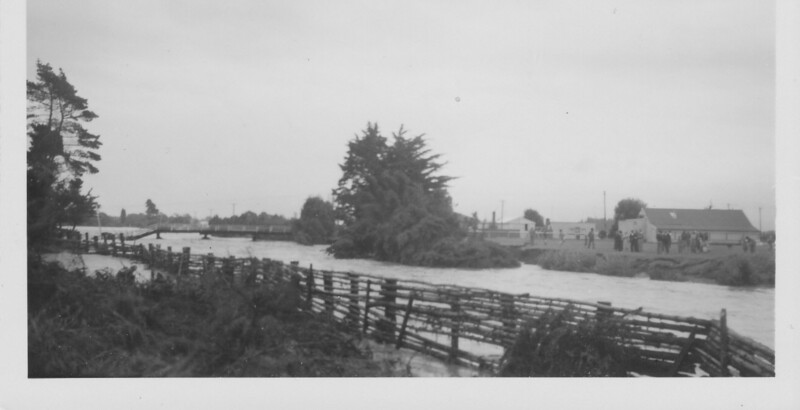 In January 1953, the Ashley broke out north of Rangiora and headed across country. Old-timers (defined as people who have lived here a long time and are at least 10 years older than me) often use that as the bench-mark of the Ashley’s capabilities. I recently came across these photos of my mother’s – at the time she was a young widow with two small boys in tow. I was a five-year-old at the time, on holiday in Waikuku (in Pine Avenue on the south side from the Lagoon) from Christchurch. 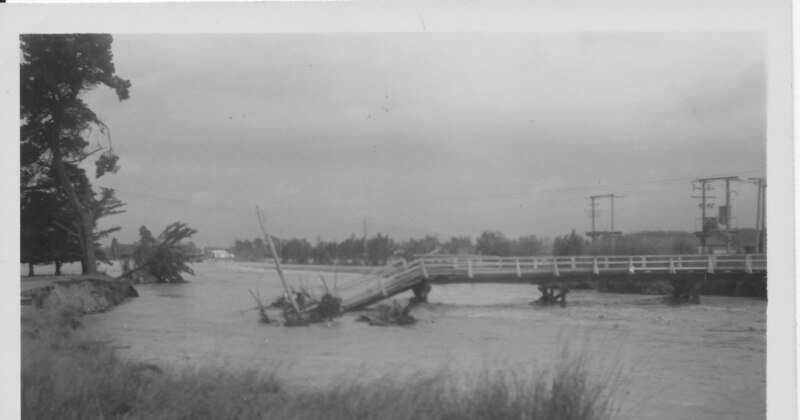 The water headed towards Waikuku and broke the bridge that used to cross the lagoon. The water filled up the low ground to the south for a considerable distance and was eventually released by bulldozing out the sandhills where the surf club now sits. Those of us on the south side were trapped, although not in any danger. As a little boy, I found it quite exciting! I can well remember the churning water heading out to sea once it was released. I can also remember air-drops of food being made to the store on the other bank – very few helicopters in those days! Once the water had subsided the men set to work building a footbridge across the remains of the road bridge. This gave us access to the store. 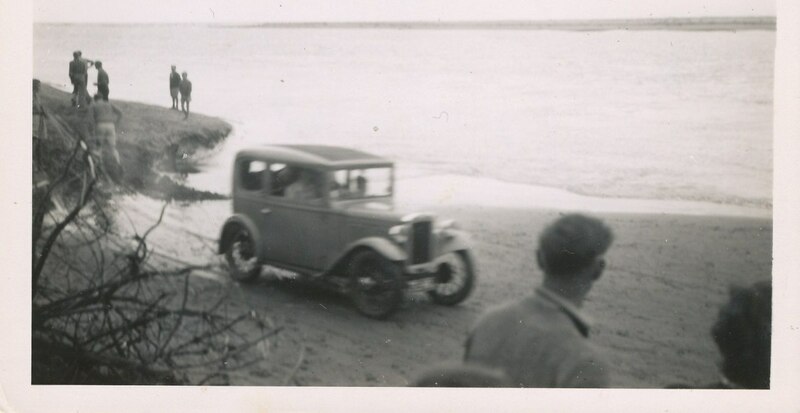 Eventually those on the south side got their cars out by driving in convoy along the beach to Kairaki. We were third in line but my mother’s little Austin 7 couldn’t keep up with the first two, so the rest of the convoy had to go out our pace! The photo below shows our arrival at Kairaki. The older building dates from the 19th Century and is a Category 2 Historic Place. 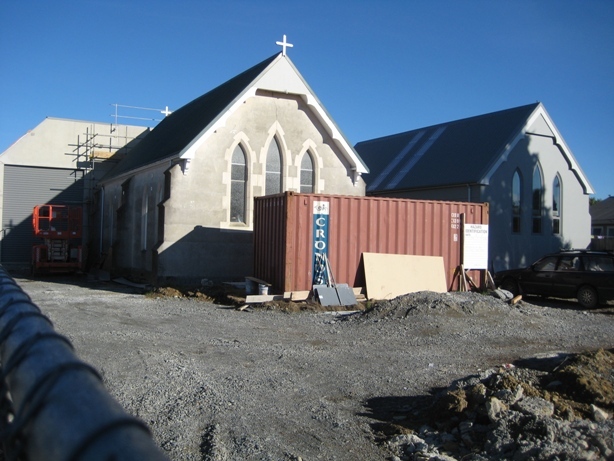 It is the orginal church, replaced by the 1950s building seen on the left – a scaled-down version of Trinity Methodist Church in Rangiora. The Horrellville church is now part of the Oxford District Union Parish. Canterbury has lost so much heritage, it is good to see some surviving. The Oxford War Memorial is on Main Street in a part of Pearson Park that is often used for community events. 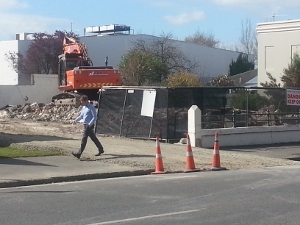 The earthquake loss of Kaiapoi’s Riverside church (formerly the Rialto Theatre) was very sad. 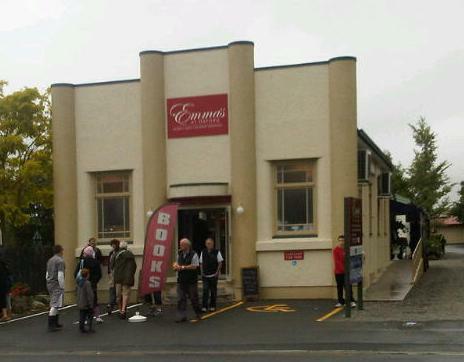 Fortunately we still have some art deco left in the District, such as the former Salvation Army building in Oxford, now Emma’s Bookshop – open this morning for Oxford’s Day in the Country. 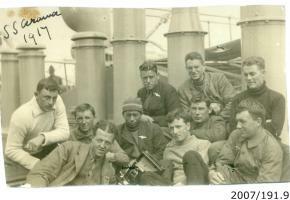 We have received the following message from Freddy Declerk of Zonnebeke, Waimakariri’s sister district in Belgium. The remains of soldiers from World War I battles are frequently found on the past battlefields of Flanders and France. Mayor Dirk Cardoen and I from Zonnebeke will attend the reburial of a NZ soldier, tomorrow Friday at 3 PM local time. The soldier is from the Rifle Brigade and died on June 7th 1917 during the attack on Messines. We will have a wreath on behalf of the people of Zonnebeke and Waimakariri. The NZ Minister of Defense will attend together with the Defense Chief, a Belgian Minister and other dignitaries. Since 1874, St Matthew’s has been a centre for the Fernside community. It is one of several in the District designed by the notable colonial Church architect, Benjamin Mountfort. Bishop Harper laid the foundation stone and within 6 months the church had been built and was debt-free, because he was able to return and consecrate it. 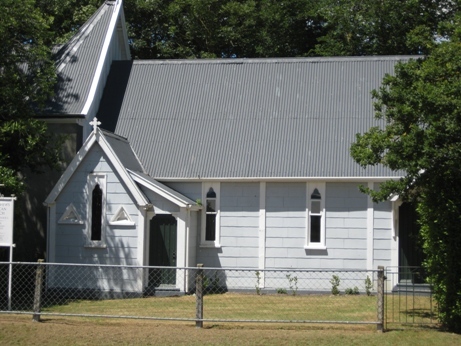 The church can be found on the corner of Mount Thomas and Mairaki Roads. The Ashley Community Church is looking for a secretary/treasurer – or perhaps two people to carry out each role. Despite appearances, this isn’t actually a church group. We are a small group (I’m a member of it) dedicated to maintaining and restoring this Category II Historic Place. It is actually in quite good condition, but there is always work to be done. The church dates from the 1870s and was designed by the notable colonial church architect, Benjamin Mountford – which is part of its significance. It was formerly an Anglican church but is now owned by the society. A small Orthodox congregation currently uses it. If you think you can help, please contact me. As secretarial and treasurership jobs go, it isn’t a big one. 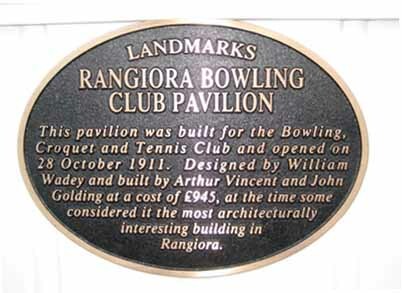 The Rangiora Town Hall received a “Landmarks” Plaque today – 84 years to the day after it was opened. Somewhat controversial at the time (what’s new?) it now generates a lot of enthusiasm amongst many locals. It is one of the very few theatres of its type left in New Zealand. The plaque was unveiled by Malcolm McIntosh (left), great nephew of the mayor of the time, Robert McIntosh (his wife Robina performed the actual opening in 1926). 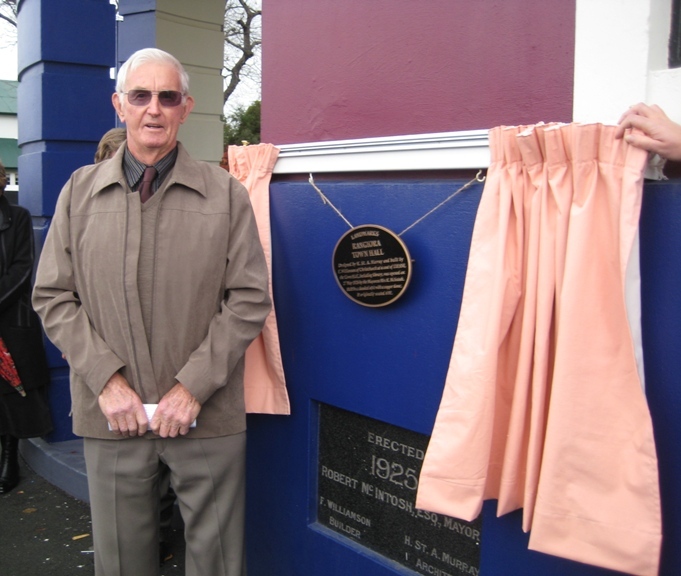 Robert was one of the two McIntosh brothers who were mayors of Rangiora and Kaiapoi at the same time. As you can see, the plaque has yet to be fixed. The wet weather has meant that the necessary adhesives might not work! 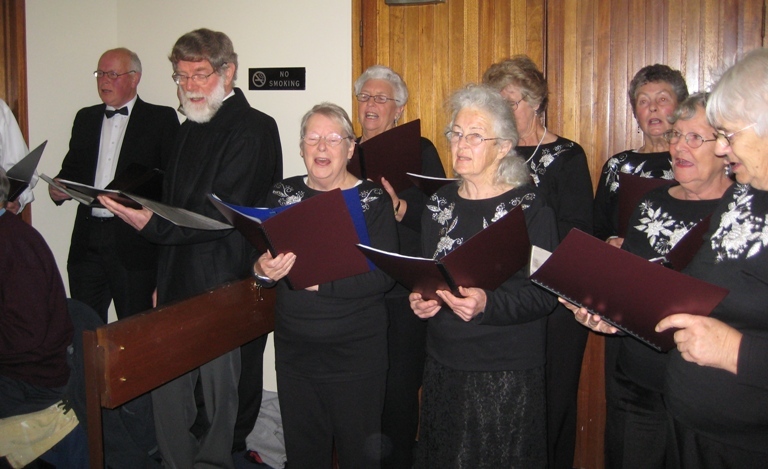 The unveiling featured songs from the 1920s sung by the North Canterbury Musical Society Singers (conducted by Gail Fox), speeches from Dave Sanderson of the Musical Society and from the current and former movie theatre operators, Patrick Walsh and Fred Read. Yours truly added a few historical details. Outside, there were a couple of Model A Fords supplied by Peter Bayler and Alan Hill. The grand old lady holds lots of stories and some were relayed by people present today. It was a good way to celebrate one of the District’s notable buildings.